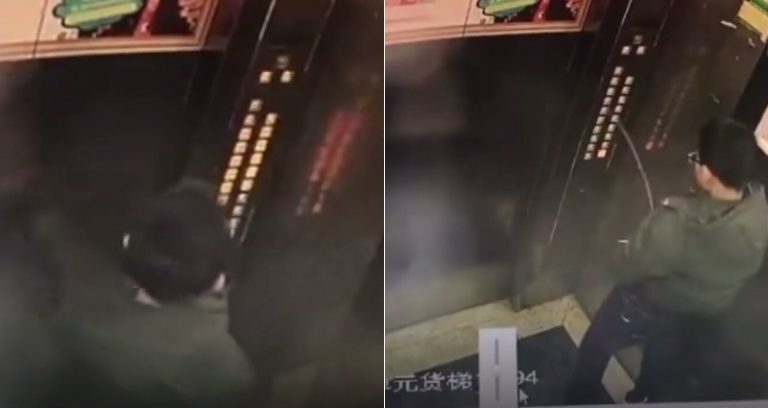 A naughty Chinese boy who was riding an elevator alone got stuck after he peed all over the buttons of the lift. According to the Straits Times, the boy from Chongqing was captured on CCTV doing his business as soon as soon as the doors of the elevator was closed on 23 February. However, his actions triggered a malfunction, which saw him stuck in the lift. While the experience lasted, the control panel started to blink, throwing the young man into frenzy. The lift eventually was plunged into darkness. He was later rescued, but nothing was said about any punishment meted to him. Anyway, he must have learnt his lessons the hard way…don’t you think?